Oracle Automatic Storage Management Cluster File System (Oracle ACFS) is a multi-platform, scalable file system, and storage management technology that extends Oracle Automatic Storage Management (Oracle ASM) functionality to support all customer files. Oracle ACFS supports Oracle Database files and application files, including executables, database data files, database trace files, database alert logs, application reports, BFILEs, and configuration files. Other supported files are video, audio, text, images, engineering drawings, and all other general-purpose application file data. Oracle ACFS conforms to POSIX standards for Linux and UNIX, and to Windows standards for Windows. 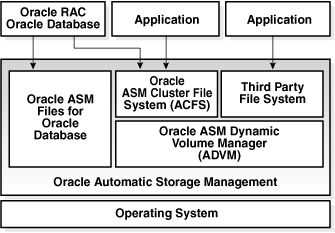 Description of "Figure 11-1 Oracle Automatic Storage Management Storage Layers"
Oracle ACFS establishes and maintains communication with the Oracle ASM instance to participate in Oracle ASM state transitions including Oracle ASM instance and disk group status updates and disk group rebalancing. Oracle Automatic Storage Management with Oracle ACFS and Oracle ASM Dynamic Volume Manager (Oracle ADVM) delivers support for all customer data and presents a common set of Oracle storage management tools and services across multiple vendor platforms and operating system environments on both Oracle Restart (standalone) and cluster configurations. For an overview of Oracle ADVM, see "Overview of Oracle ASM Dynamic Volume Manager". Oracle ACFS is tightly coupled with Oracle Clusterware technology, participating directly in Clusterware cluster membership state transitions and in Oracle Clusterware resource-based high availability (HA) management. In addition, Oracle installation, configuration, verification, and management tools have been updated to support Oracle ACFS. Oracle ACFS can be accessed and managed using native operating system file system tools and standard application programming interfaces (APIs). Oracle ACFS can also be managed with Oracle ASM Configuration Assistant. Oracle ACFS can be accessed using industry standard Network Attached Storage (NAS) File Access Protocols: Network File System (NFS) and Common Internet File System (CIFS). However, CIFS clients on Windows cannot use ACLs when interfacing with Oracle ACFS Linux, Solaris, or AIX servers, but can use ACLs with Oracle ACFS on Windows. In addition to sharing file data, Oracle ACFS provides additional storage management services including support for the Oracle Grid Infrastructure clusterwide mount registry, dynamic online file system resizing, and multiple space efficient snapshots for each file system. For more information, refer to "Oracle Clusterware Resources and Oracle ACFS Administration"
Oracle ACFS accommodates large storage capacities and large numbers of cluster nodes. It efficiently manages large numbers of file systems, files, and supports both small and large sized files with exabyte-capable file and file system capacities. Oracle ACFS provides optimized fast directory lookup for large directories with millions of files. Oracle ACFS file systems are generally mounted on all Oracle Cluster Synchronization Services (CSS) cluster members. In the event of a member failure, another cluster member quickly recovers any outstanding metadata transactions on behalf of the failed member. Following recovery, access by other active cluster members and any remote client systems can resume. For all applications, Oracle ACFS performance is best with larger write() sizes, such as 8 K or larger. For best performance, use the Deadline I/O Scheduler for the disks in the disk group on a Linux system. When using a file system across cluster nodes on Windows platforms, the best practice is to mount the file system using a domain user, to ensure that the security identifier is the same across cluster nodes. Windows security identifiers, which are used in defining access rights to files and directories, use information which identifies the user. Local users are only known in the context of the local node. Oracle ACFS uses this information during the first file system mount to set the default access rights to the file system. Refer to the Oracle Database Installation Guide for the Windows platform for information about Oracle Base permissions when a file system is mounted under Oracle Base. Oracle ACFS does not support any files associated with the management of Oracle ASM, such as files in the Oracle Grid Infrastructure home and in the Oracle ASM diagnostic directory. Oracle ACFS does not support Oracle Cluster Registry (OCR) and voting files. Oracle ACFS functionality requires that the disk group compatibility attributes for ASM and ADVM be set to 11.2 or higher. For information about disk group compatibility, refer to "Disk Group Compatibility". To use an Oracle ACFS file system for an Oracle Database home, the release level must be Oracle 11g Release 2 (11.2) or later. For information about managing and monitoring Oracle ACFS, refer to Managing Oracle ACFS with Command-Line Tools and Using Views to Display Oracle ACFS Information .